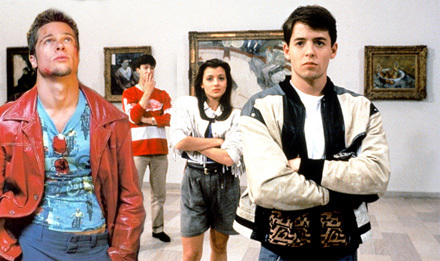 So what if Ferris (and Simone) were only figments of Cameron's delusional imagination, like Tyler Durden in fight club? What if Cameron was alone throughout the whole Chicago adventure? This theory has been around for a few years, but I have only recently discovered it. This post (and many others) explore this posibility. A consiracy therory mashup of two of my favorite movies? Treat yourself to a copy of each. The're on BluRay. Charley Likey.